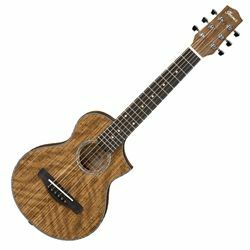 The EWP Ibanez combines the compact size of a ukulele with the musical sophistication of a guitar. Steel strings and a 42mm nut width make a guitar player feel immediately at home. Add a graceful compact Florentine cutaway and you've got a little guitar that'll go a long way — for practice, jamming or late night road warrior relaxation.